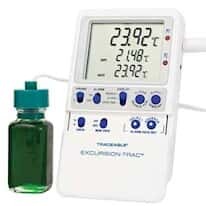 Digital thermometers (digital indicators) allow you to quickly verify temperatures of foods, liquids, baths, air/gas, incubators, refrigerators and freezers. They are compact, easy-to-use, and offer results almost immediately. Browse our large selection of pocket, wall- and table-mount digital thermometers. We have general purpose and professional thermometers ideal for the food industry.